3.8 million gallons of gas are wasted everyday in the USA. Learn more by clicking here. When we respect the earth in its totality, when we rethink how we do things, when we practice the three R's - reduce, reuse, recycle, - we instantly have a beneficial effect on the world. Here is the Environmental Protection Agency's (EPA) definitions for those three R's. Redesigning products to use fewer raw materials in production, have a longer life, or be used again after its original use. Reuse: is reusing items by repairing them, donating them to charity and community groups, or selling them to reduce waste. Reusing products, when possible, is even better than recycling because the item does not need to be reprocessed before it can be used again. 100 million trees are pulped every year in the USA in order to make bulk mail. More than half of that mail is thrown away, unopened. Visit www.directmail.com to have your name removed from mailing lists for free. It takes a few months to see the results, but it works really well. Other ways to reduce pulping of trees – use a tote bag when you shop, switch to cloth napkins, use rags in place of paper towels. Print on both sides of your paper. And don’t forget, buy recycled paper products whenever possible. Paper production and waste is considered to be the third leading cause of global warming. If you would like to continue receiving some catalogs, but stop others, visit www.catalogchoice.org. The service is free and the site is chock full of good environmental information. If you would like to opt out of any or all phonebooks you receive, visit this great site. Learn about the effects of paper production and waste here. Are you tired of getting phone calls asking for money? You can register for the National Do Not Call Registry for free. It is very easy and only takes about a minute. Internal combustion engines are polluting and their use should be minimized. Period. Gas mileage decreases rapidly at speeds above 60 mph. Plan your trips before you go. Several short trips taken from a cold start can use twice as much fuel as a longer multipurpose trip covering the same distance when the engine is warm. You will also avoid retracing your route and reduce the distance you travel. You will not only save fuel, but also reduce wear and tear on your car. You will save gas by turning the engine off and restarting it again if you expect to idle for more than 10 seconds. You will also prevent pollution by avoiding long idles. Try parking your car and going into restaurants, banks, and such instead of idling in drive-up lanes. You might even finish your errands faster! Or, turn your car off while you’re in the line. Idling can consume as much as a gallon of gas per hour. Idling also wastes more fuel than restarting the engine. For more information, visit this site. Under inflated tires waste gas and affect the life of your tires. The engine should be warmed up before driving. Reality: Idling is not an effective way to warm up your vehicle, even in cold weather. The best way to do this is to drive the vehicle. With today’s modern engines, you need no more than 30 seconds of idling on winter days before driving away. Idling is good for your engine. Reality: Excessive idling can actually damage your engine components, including cylinders, spark plugs and exhaust systems. Shutting off and restarting your vehicle is hard on the engine and uses more gas than if you leave it running. Reality: Frequent restarting has little impact on engine components like the battery and the starter motor. Component wear caused by restarting the engine is estimated to add $10 per year to the cost of driving, money that will likely be recovered several times over in fuel savings from reduced idling. The bottom line is that over ten seconds of idling uses more fuel than restarting the engine. Composting is a great way to reduce waste going into the system, while creating something beneficial for your garden. You can have a very simple system - a simple bin where you throw compostable items - "compost happens", or mine the gold in your waste. Check out this great link for more information. If every American home replaced just one light bulb with an Energy Star qualified LED, we would save enough energy to light more than 3 million homes for a year, more than $600 million in annual energy costs, and prevent greenhouse gases equivalent to the emissions of more than 800,000 cars! Change out all your old bulbs for low energy CFLs or LED's and save your old bulbs for spares. Do it today and watch your savings mount. Buzz up! Virtually all of your electronics are sucking up energy even if they're turned off or not being used. Some of the biggest culprits include your TV, computer, and printer. Even your electric toothbrush is drawing energy when it's plugged in and sitting idle. On its own, the "vampire power" used by one device might seem minuscule, but collectively it amounts to more than $4 billion a year of wasted energy here in the United States. What's more, the Department of Energy says that about 75 percent of the electricity used to power home electronics is consumed while the products are turned off. For the slightly more ambitious, buy a power strip at your local hardware store. Yes, it takes a little time up-front to plug everything into it, but you'll more than make up the time when you can cut all power with just the flip of a switch. Clamping down on vampire power is one of the easiest ways to save money on your electric bill (about 5 percent a month) and pump less carbon dioxide into the atmosphere. It may not seem like much, but it all adds up! This information is from environmental journalist Lori Bongiorno. A gasoline-powered lawn mower run for an hour puts out about the same amount of smog-forming emissions as 40 new automobiles run for an hour, according to the Clean Air Yard Care. Consider switching to a push mower or a cordless electric mower. Today's non-gasoline-powered reel lawn mowers are easier to push than the old models. Their eco-benefit: zero emissions (plus, you're getting great exercise). If you prefer a power mower, consider a quiet, battery-operated model from Black & Decker. The average cost in electricity to run one for a year is five dollars. Check out this information from eartheasy. Plan for recycling as soon as you begin planning your event. This will allow you ample time to obtain recycle containers and make signs for them before the event begins. It is important to place a recycle bin next to each trashcan. Often, you'll need less than half the number of trash cans used before recycling, since recyclables make up a large percentage of the “trash". Because the goal is to make recycling easier than wasting, the more people grow accustomed to seeing recycle bins next to trashcans, the better. Even if you don't think you need a recycle bin at your event, consider placing one there anyway. More than 141 billion containers were wasted in the USA in 2006. Offset the carbon you can't control at your event. Visit www.nativeenergy.com for more information. This is a proven organization. They help build and support new clean and renewable sources of energy that reduce global warming pollution and create sustainable economies for Native Americans, family farmers, and local communities. If you will have vendors at your location, make sure to ask them to only use the items recyclable in your community. Ask them to put a sign at their site encouraging recycling of the items they sell. That means less time for you pulling the recyclables from the trashcan! Make sure to let them know they can break down their cardboard and place it by a recycle container. Paper production and waste is considered to be the 3rd leading cause of climate changing greenhouse gas emissions and forest destruction. When you put up a flyer for your event, make sure it is printed on recycled paper that can be recycled in your community. Make a list of the places where you have hung flyers, and go retrieve them for recycling right after the event. Include a line on the bottom of your flyer saying something like “This flyer is made from recycled paper that can be recycled at...”. It may seem like a small thing, but it's not! This sets a great example about being responsible for the things we put out in the world. Read this article on the environmental impact of paper. Coffee grounds, tea bags, fruit and vegetable leavings make great compost. Consider placing compost buckets next to your recycling bin, which is next to your trash can. Contact Moab Solutions for a consultation on your event recycle system. We are constantly learning about the best way to collect recycling at events large and small and are more than happy to share our thoughts about recycling at your event with you. Or, tell us what we need to add to this guide! (435) 259-0910. The small choice between using cold water and hot water to run a load of laundry makes an enormous difference. Hot wash cycles use 90% more energy without getting your clothes any cleaner. On top of that, the hot cycle makes colors fade and wears out your clothes more quickly. Walk, ride your bicycle, roller skate, skateboard or skip instead of driving your car whenever possible. You’ll get a little exercise and do the planet a good turn at the same time. For an added bonus, carry bags to collect trash and recycling during your walk. Many stores sell items in bulk. Take your own shampoo/conditioner/soap/lotion or food containers & refill them at your local market. It usually costs less and you can use the same container over and over again. Think of all the plastic and glass you’ll keep from the recycle center or landfill. Yeah! Use cloth bags or a basket when you shop. Many stores offer a cash discount for each bag you bring. Show your individuality or promote a cause with your favorite tote bag. In the United States, 14 million trees are pulped and 12 million barrels of oil are used to make paper and plastic bags each year. From hikers to Hummers, we all have an impact on the earth. It is up to each of us to decide what kind of an impact we want to make. Mitigate the more negative ones by walking gently upon the earth. The cumulative impacts of multiple user groups harms natural areas. 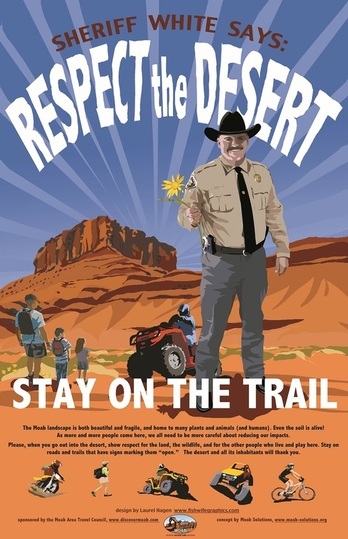 We can all do our part and watch where we are going when we hike, bike, or off-road. Respect the earth. It's the only one we've got. To download a free, high resolution poster, visit the Moab Area Travel Council website. Perhaps the most compelling reason to use green cleaners is to keep potent toxins out of your home. The US Environmental Protection Agency (EPA) notes that many household cleaners contain volatile organic compounds (VOCs) such as formaldehyde and harsh acids. Since indoor VOC levels are often two to five times greater than outdoor levels, humans can experience “eye, nose, and throat irritation; headaches; loss of coordination; nausea; and damage to liver, kidney, and central nervous systems” from indoor exposure to these chemicals, according to the EPA. You do -- with our help. Just ten basic ingredients that are probably already in your home will tackle most cleaning jobs Your home will sparkle, germs will still run in fear from your sponges and rags, and your indoor air will be better than ever. An antifungal that also kills germs and bacteria. Eliminates odors and works as a gentle scouring powder. Borax, the common name for the natural mineral compound sodium borate, eliminates odors, removes dirt, and acts as an antifungal and possible disinfectant. Use with care around children and pets, as it can be toxic if swallowed. A great nontoxic bleach and stain remover, as well as a proven disinfectant. A stain remover and polisher. A pleasant-smelling nontoxic bleach, grease-cutter, and stain remover. An all-purpose cleaner, grease-cutter, and disinfectant. “Castile” means the soap is vegetable-based, not animal-fat-based. Great at picking up carpet spills. Makes a wonderful furniture polish. Adding all-natural, organic essential oils to your cleaning concoctions can add wonderful scents to your housekeeping endeavors. Some—such as lavender, peppermint, eucalyptus, lemongrass, and tea tree oils—also may have antibacterial, antifungal, or insect-repelling properties. To find pure, organic essential oils, visit your local health food store. Remember to use care with essential oils, as they can cause harmful reactions when ingested or put directly on the skin. Some are considered dangerous for pregnant women (to be safe and simplify things, stick with eucalyptus, lemongrass, and tea tree oils for all recipes below if you’re pregnant). If you want to try an oil we haven’t mentioned in this article, consult a reliable source on its proper usage, such as the aromatherapy education section of Frontier Natural Products Co-op’s web site. An all-purpose cleaner is just that—something you can use for just about every surface in your home, from kitchen counters and appliances to bathroom surfaces and walls. Clean House, Clean Planet author Karen Logan offers this recipe for the all-purpose “Alice’s Wonder Spray”: Put 2 Tbsp. white vinegar and 1 tsp. borax into a 16 oz. spray bottle. Fill the rest with very hot water and shake to blend until the borax is dissolved. Add 1/4 cup of liquid castile soap only after you’ve completed the above steps. If you want to scent your spray, also add 10–15 drops of an essential oil, such as lavender, lemongrass, thyme, eucalyptus, rosemary, rose, or clove. The spray will keep indefinitely. For an even simpler solution, try cleaning with two cups of club soda in a spray bottle. Author and Care2.com healthy living editor Annie Bond (a.k.a. Annie Berthold-Bond) recommends this solution for all hard floors (except when directed by the manufacturer to avoid even mild detergents): Combine 1/4 liquid castile soap, up to 1/2 cup white vinegar or lemon juice, and 2 gallons of warm water in a large plastic bucket. Use with a mop or sponge. To clean and disinfect your carpet, the CHEC recommends blending 1/2 cup baking soda, 1 cup borax, and 1 cup cornmeal. Sprinkle mixture over rug and rub with a cloth. Let rest for several hours or overnight, then vacuum. To remove stains from your carpet, Logan advises mixing 1/4 cup liquid castile soap and 1/3 cup water in a blender until foamy. Spread the mixture on the carpet and let sit for a few minutes, then scrub the stain with a brush or clean rag. Also, club soda will remove many acidic stains, like coffee, wine, or juice. To deal with big carpet spills, pour cornmeal on the spill, wait 15 minutes, then vacuum. You can use the all-purpose cleaners recommended above or, for even simpler bathroom cleaning, use baking soda or borax as a scouring powder. For a softer scrub, Bond says to combine 1/2 cup baking soda with enough liquid soap to achieve a frosting-like consistency. You may want to add 5-10 drops of an essential oil for fragrance. Club soda works wonders on plumbing fixtures. Sprinkle baking soda or borax, or pour white vinegar into the toilet, and let sit for a few minutes. Scrub with a good toilet brush. Cover the oven floor with baking soda, spray with water until very damp, and let set overnight. Spray with water every few hours before you go to bed to keep damp. In the morning, clean out the baking soda, and the stuck-on gunk will be loosened and ready to scrub off. To polish wood furniture, dab olive oil onto a soft cloth and rub. You may be worried about do-it-yourself green cleaners not being able to kill germs effectively. Researchers at Tufts New England Medical Center, on the other hand, worry that we’re killing too many microorganisms, saying that disinfectants found in household cleaners may contribute to drug resistant bacteria. The CHEC says that ordinary soap and water do the job well enough to keep our families safe, barring someone with a seriously compromised immune system. • Annie B. Bond—Her books, Better Basics for the Home (Three Rivers Press, 1999) and Home Enlightenment (Rodale, 2005), offer plenty of recipes and advice for green cleaning and living. • Karen Logan’s Clean House, Clean Planet—(Pocket Books, 1997). • Toxics Free Future —206-632-1545. A nonprofit working to protect public health and the environment by eliminating toxic pollutants. ©2005 Co-op America. All rights reserved.